One of the things I’ve found whilst shooting with a glove is that my fingers, especially the tendons that connect my finger tips to the rest of my hand, the ones that go over the interphalangael joints, become tender. The longer I shoot the more painful it becomes. This happens because I have a habit of cradling the string as I draw in the corner of the joint which leads to the string cutting into the tendons. As an added bonus because I’m cradling the string in my joint as I release the string rolls across the tendon and then across my full finger tip which adds to further discomfort. To try and remove this discomfort I’ve done a few things. The first is to fit a thicker string on my bow. My orginal string was 10 strands and I’ve added a few more so it’s now at 12. As the string is now thicker it’s less likely, I hope, to cause finger pinch. This however, comes at a cost as a thicker string leads to a slower bow which in turn will effect the flight of the arrow, this isn’t ideal. The second thing that I’ve done is purchase a thicker shooting glove so that my fingers are better protected. The issue I found with this is that with a thicker glove you loose dexterity in your fingers. Now for me the main reason why I shoot with a glove and not a tab is that I like the added agility a glove gives me, it brings me closer to a more intimate shooting experience and I don’t want to loose this by shooting with a thicker clumsy glove. I tried a number of different gloves that weren’t quite right but eventually I found the Bodnik Speed Glove that gave me an ideal balance between protection and dexterity. 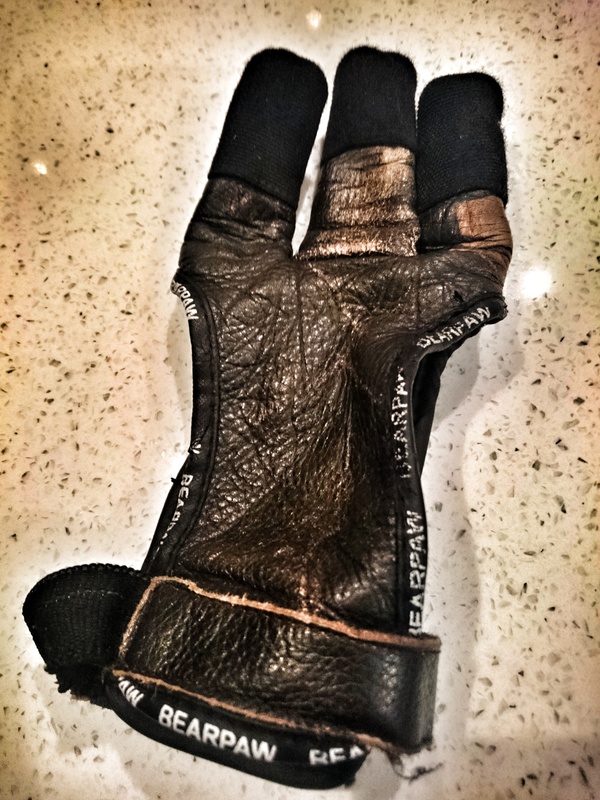 The speed glove does this by placing a fine layer of canvas material over the fingers. This canvas layer is soft enough that you can bend your fingers easily yet thick enough to protect you fingers from the string pinch. It’s a really excellent glove and seems to have helped eliminate the pain I was experiencing. As an added bonus it’s also very smooth so my release seems to be a little more consistent. The third, and last thing, that I’m trying to do is change the area of my fingers that I’m using to draw the string. So instead of the string resting on my joint and tendons I’m now trying to rest it just above them on the bottom of my fingertip pads. This, like all technique changes, is a work in progress as thinking about where my hand holds the string when I draw puts a conscious thought into my shoot sequence that can and has thrown everything else out. This will go eventually as it just a matter of making that conscious action a subconscious one. A combination of a thicker string, new glove and a change of technique has removed all of the discomfort I had when drawing and shooting for a prolonged period. This in turn has allowed me to get more out of my shooting as I can easily lose myself in the moment of the shot and not be “pulled back” to reality with a physical discomfort. Losing myself in the shot where everything else just drops away is the heart of archery and hopefully, one day I’ll be able to achieve that state everytime I shoot. Reading your in-depth description of a bowstring rolling over tendons had me cringing with sympathy pains! Glad you worked that out. Is your string served? If so, maybe you could use a 10 strand string with a thicker serving material? Seems like making a small portion of your string thicker would be lighter than making your entire string thicker. But maybe it’s just splitting hairs at that point. Good post! Yes, I do use serving on my string and if I’m honest the thought never occurred to me to double the serving thickness. Face meet palm! If I’m honest I still get the occasional tenderness in my middle finger so I must still be doing something slightly wrong… or I have a wired shaped middle finger.